Enter the size of your lawn to estimate how much sod you need, and add the price per roll to estimate how much it will cost. Read below for more details on choosing sod and its installation. 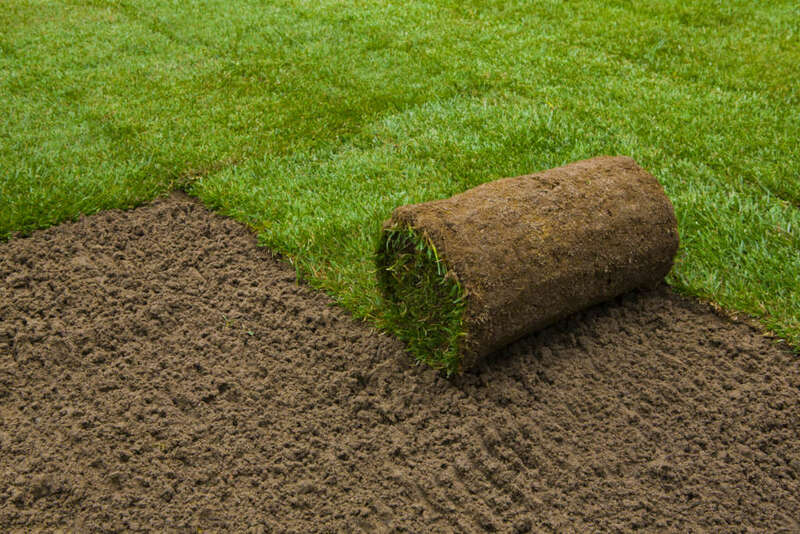 Optionally enter the price per roll of sod - average is $3 to $5 per roll. Growing a lawn from scratch is very economical, but it can be tricky and time-consuming as well. If you are considering seeding your lawn, you can use our grass seed calculator. However, laying sod provides many advantages over direct seeding. Perhaps the greatest advantage of sod is that it provides an instant lawn. You don’t have to wait for the right season for planting, or germination and growth, or contend with competition from weeds. Sod can be installed in nearly any season as long as the ground is not frozen, and it is delivered fully mature and weed free. Establishing sod uses less water than growing seed, too, which is good for the environment and your pocketbook. Finally, sod is fast to lay down giving you beautiful landscaping in a matter of hours instead of months. Sod must be laid on leveled soil that contains organic material. If you need to add soil, use our soil calculator to help you calculate how much you will need. Contractors can help you with soil, grass variety choices, delivery, and installation. You can use our contractor locator tool to help you find local contractors willing to give you a free estimate for your project. To calculate how much sod you need, you need to know how big the area is that you want to cover. Measure the length and width in feet. Plug those numbers into the calculator above and let it do the work for you. Or if you know the acreage, you can use that number. If your area is irregular in shape, measure it in smaller, regularly shaped areas. Add the lengths together. Add the widths together. Enter the final results in the calculator. If you already have a specific type in mind and know the price, insert that price for a more accurate estimate of cost. If not, learn more about how much sod costs. The calculator above instantly tells you how much sod you need in rolls and pallets, plus the approximate cost. 1: Calculate square footage of the lawn for new turf. Measure the length and width of the area to be sodded. Multiply them together to obtain sq. ft. If needed, use our acreage calculator to find the size of your lawn. 2: Divide the square footage result by 10 (most rolls cover ten sq. ft.) to obtain the number of rolls of turf needed. 3: If ordering by the pallet, divide the number of rolls needed by 45 to obtain the number of pallets needed. 4: Multiply the number of rolls or pallets by the price of the sod you desire to obtain the total cost of your lawn. Suppose you have a new yard that is 0.13 acres that you want to sod in Kentucky Bluegrass. You know that bluegrass costs $7 a roll in your area. 0.13 acres × 43,560 sq. ft. = 5,662.8 sq. ft.
Sod comes in pre-cut rectangles that are rolled up and stacked on pallets. The size of the rectangle depends on what type of machine the grower used to harvest it. The rectangles can range from 16” to 24” wide for “rolls” and up to 4’ wide for “slabs.” Lengths vary as well and can range from 3 ½’ to 6’ long. Regardless of rectangle size, a typical pallet will contain enough sod to cover about 450 sq. ft. or 50 sq. yards. If your turf supplier uses non-standard sizes, they will be able to give the coverage of a roll or slab in square feet. Follow the example above to calculate the number of rolls by dividing the total square footage by the square feet per roll. For very small areas, you can buy sod by the roll. But, if you have more than 400 sq. ft., consider buying it by the pallet. Your supplier will usually deliver it for a small fee. If you are contemplating transporting sod yourself, bear in mind that one pallet weighs between 2,800 lbs and 3,200 lbs depending on the moisture content. Ensure that your truck or trailer is capable of handling this load. Our lawn mowing calculator will help you estimate how long it will take to mow your new lawn. Enjoy your new lawn!